It was time to get my bang on. Because white Keds, layered pink and white socks, and an off the shoulder black and white striped fake Forenza top would be ruined without my signature bangs. LOL!!! That is hilarious. Oh, how I don't miss the days of big bangs. Now if only those skinny jeans would leave us alone once and for all. I miss big bangs! That's probably why I'm still single... holding out for a girl with big bangs! LOL! What a great story Sarah! The days of the big bangs - ahh the memories. I am laughing at Jenni's comment about the skinny jeans - I couldn't agree more! I remember those big bangs too. I'm sure that's why Tom came over! I still think Tom Selleck is pretty cute! did you ever write in for the autographed picture? and did you watch the movie that he was filming? That is hilarious. Boy those were the days, huh? I remember the sizzle quite well. I called it the praying mantis look. Makes me wonder what kind of trends my girls will go through. Get out! Get out! You met Tom Selleck? That is hilarious. Oh, the bangs, the bangs... I'm so glad the 80s are over. Hair took SOOO long to fix. What a fun memory! And oh the bangs...thanks for bringing us back! And you are famous...you're a blogger! 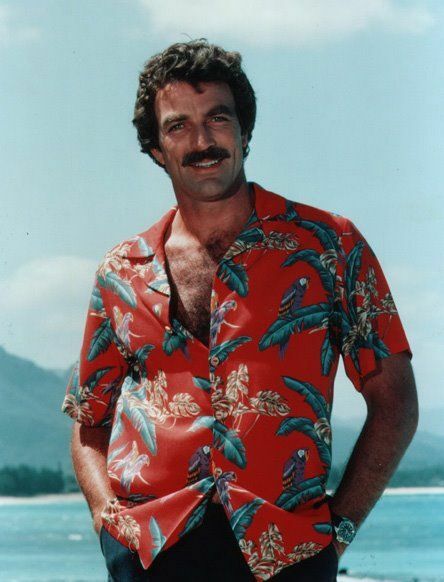 My friends and I used to go to a hiking trail that overlooked where Magnum P.I. was filmed in Hawaii. We never saw Tom Selleck, but we did see the Robin Masters compound. Ok, that was just too funny! You're way more famous that I am...maybe I should get your autograph!! But Tom Selleck!!!!! I loved Tom Selleck, and must confess that here! I always tell my Bill that I have only ever loved 2 men in my life, him and Tom Selleck! Lol...love the boys and how you are such a sweet mommy!If you get a chance we miss you on the Tuesday Caption Contest! I still act like it's a big deal when I tell people we met Tom Selleck!! Maybe I'm stuck in '82??!! yikes!! And Zane - just go about a 60 mile radius in any direction from Raleigh and your bound to find what you're looking for!!! Hilarious! You know, I vaguely remember it being a big deal when Tom Selleck was in this area shooting the series finale of Magnum PI...like Annapolis or something? Was that the same thing, I wonder? And the bangs...nothing like the smell of burning Salon Selectives and super hard bangs. I want to know how many pairs of slouch socks you had on! I am a HUGE Tom Selleck fan. He's always the good guy. Love those good guys. Once I saw Robert Redford when we were at the beach. He's another one of those "good guys" - and he has great hair, like Tom. :) And he was totally cute, too. Oh, but I have a funny "celebrity story" too, now that I think of it! I think I'll post it and link back to you! Maybe we'll start a "thing" here, who knows! Oh girl, my poofy bands had three layers! Thank the good Lord for flat irons!